Labour MPs must set aside their own "personal red-lines" to find a compromise in order to resolve the Brexit deadlock, according to Wales' first minister. 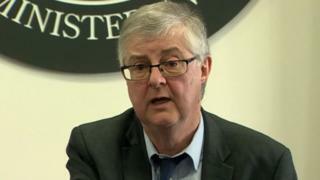 Mark Drakeford said MPs need to find agreement on a way forward that is not "necessarily their top preference". MPs will hold further votes on Monday night on Brexit alternatives. Theresa May's EU withdrawal agreement was rejected by the House of Commons last week for a third time. The first minister also dismissed the idea of the prime minister asking MPs to vote on her Brexit deal for a fourth time. "Had she been defeated narrowly the first time there was a case for her saying that she could try and persuade more people and bring them over," Mr Drakeford said at his monthly press conference in Cardiff. "What does it take for that message to get through to her that her proposition cannot and, I believe, will not secure a majority? "She must move, just like everybody else must move ... to find a place where that majority can be secured," he added. In an attempt to force the government's hand, MPs will hold their second non-binding vote later on a series of options to see if any of them can command a majority in Parliament. Mr Drakeford did not recommend MPs back any of the specific options available to them in today's indicative votes. He said he would welcome "any step" that shifts government policy towards the soft Brexit outlined in a joint Labour-Plaid Cymru white paper in 2017. Plaid Cymru's international relations spokesperson Delyth Jewell AM said it was "simply unacceptable" for the first minister to refuse to "tell the public which options he's advocating". But Mr Drakeford said he had been "clear and consistent" that another referendum should be called if the House of Commons cannot agree. Mrs May's "manoeuvring" had made a general election less likely, he said, even though it was the "constitutionally proper" way to solve the crisis. He added: "I understand that Labour's handling of things at the Westminster end has been frustrating to a number of our members, who are very committed to finding a way of not leaving the European Union or having a very close relationship with the European Union. "Just as I know that if you knock doors in Labour-supporting areas that voted powerfully to leave, there is a frustration there that Labour hasn't delivered on the instruction - as they would put it - that we were given." Meanwhile pro-EU Conservative MP Guto Bebb said a general election would not resolve the political deadlock over Brexit. The former Wales Office minister said an early poll was a "possibility", but it would not "solve anything". The Aberconwy MP told Radio Cymru it would be "difficult" to see how either Labour or the Conservatives could write a manifesto because of the lack of agreement within each party on the way forward on leaving the European Union.